The Yurts of Cave B Inn are located a beautiful ten minute walk away from the Cave B Inn main lodge. Adjacent to the vineyards of Cave B Estate Winery and on the south end of the property, the yurts offer a more rustic take on the classic Cave B experience. Each yurt is environmentally-sensitive; framed in sustainable Douglas Fir. 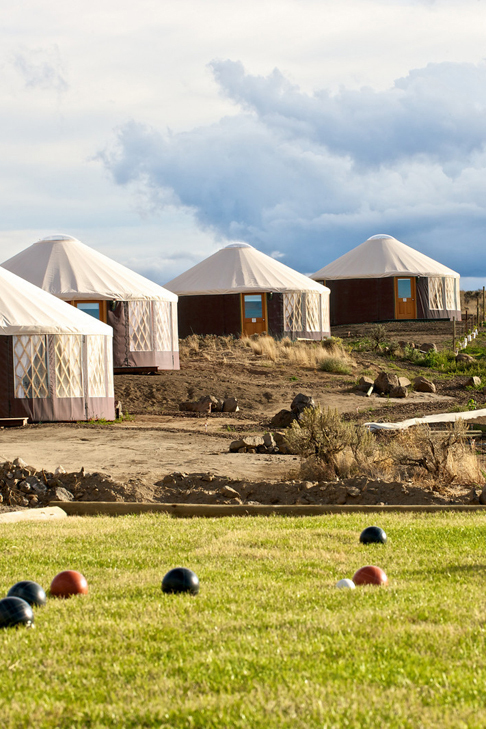 Set upon sites designed to maximize vineyard or Columbia River views, the yurts provide a closer-to-nature experience for those who would like to enjoy the restaurant, spa, winery, pool and activities of Cave B for a lesser price. Who would enjoy our yurts? Those who enjoy camping but have always wished for that same "out there" experience without the freezing noses and toes, the hard ground, the shared restrooms and the lack of privacy. The yurts provide a king sized bed, private in-yurt bathroom, modern sofa, table and chairs, mini-fridge, teapot, and Ipod docking station to play your own tunes. Minimalist decor allows you to enjoy the beauty of the yurt architecture itself: its skydome for stargazing, the latticed walls and the novelty of its curved shape. Will you experience the same level of accommodation as a private Cliffehouse or a Cavern Room? You will enjoy the same sense of spaciousness but without the added frills. Modern colored cement floors will greet your feet (so bring slippers or warm socks!) instead of the carpets of the Cavern Rooms or the wood floors of the Cliffehouses. Canvas walls replace the solid walls of the permanent structures. You may hear snippets of your neighbors talking, or their laughter. (And you'll also hear more birdsong and the rustle of the vines in the wind.) Rugged shale pathways lead you to your yurts (so bring sturdy shoes) instead of paved paths. And...you'll also experience the most authentic vineyard experience on-property, with the vines right outside your yurt door, the plentiful birds and wildlife abounding, the sky huge and star-filled directly above you as you gaze through your skydome from your bed. If you're looking for a Cave B experience with a rugged, rustic edge, the yurts are for you. Come and enjoy Cave B in the round! Reservations: To reserve by phone, call (888) 785-2283. To reserve online, please visit our Reservations page. Dog Policy: For the comfort of guests, dogs are not allowed in the yurts at any time, or left outside in the yurt area. Dogs may be walked through the yurt area on-leash only. Thank you! Celebrate this exclusive midweek rate at Cave B Inn & Spa with wine tasting for two at Cave B Estate Winery. Drink in the sights, sounds, and experience of our winery destination resort in the exciting throes of harvest.